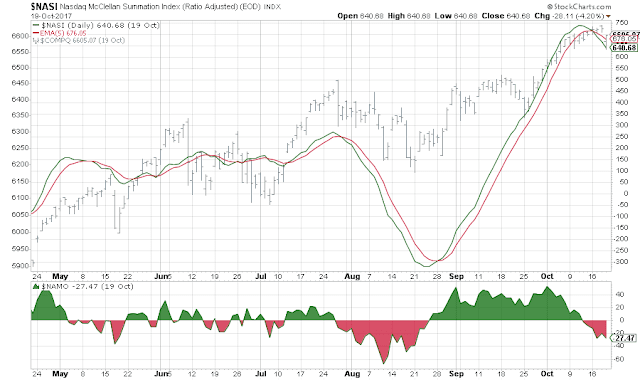 Bull market (dark green over red) the dark green 50 day average is in a rising uptrend. Notice the 50 day slope second window, could this be a long term trend change? BULLISH Bull market -- expect bullish outcomes. Lots of jobs! Small Bump down, could be just weather. But beware this is lagging indicator. The smart money is gone before this turns down. NASDAQ breadth narrowing! Expect a top in QQQ. Bonds Sideways. Consumer flat. Mixed signal. All about the banks, a bit of a perk up in utilities. This is a very strong bull market, so don't panic... but if we are going to have a sell off in the Oct 23 to Nov 10 time period this could be the first whiff of trouble. We only have one really pessimistic chart in the whole bunch... 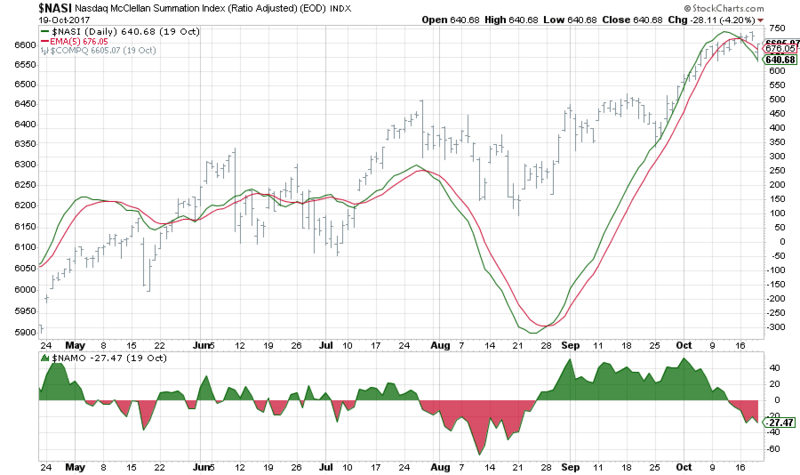 Chart 301 NASDAQ Summation, shows the NASDAQ breadth. As you can see breadth can head down long before the inevitable sell off but the sell off does generally come. Its cousin chart 103 looks very happy, but 301 sets off sooner and with little provocation. As the market moves higher, the money is betting on the big boys. This can be a bad sign as too much money chases the same play. In a bullish market, smaller firms (with room to grow) should outperform the giant firms, but that is not how the market is leaning right now. An incredible comeback in General Electric shares from a 6 percent deficit to positive also helped lift market benchmarks. Some investors bet the worst is over for the troubled conglomerate which reported abysmal earnings Friday morning and cut its forecast for the year. What a week for Bitcoin top $6000 each -- almost a double in one month. 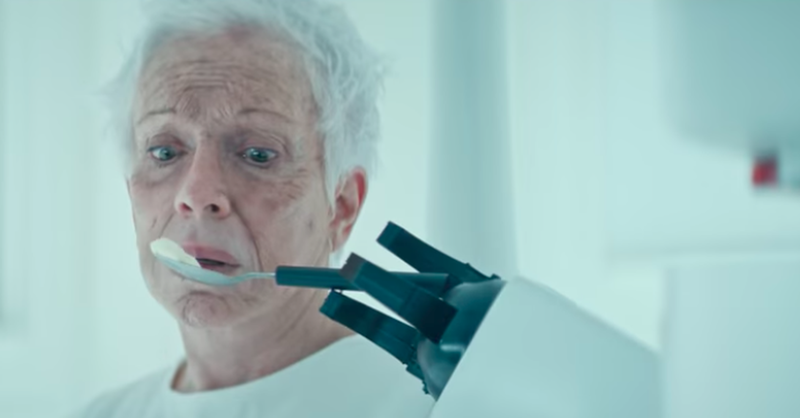 This YouTube video has 2 million views and climbing... all watched on cell phones.... ahem. 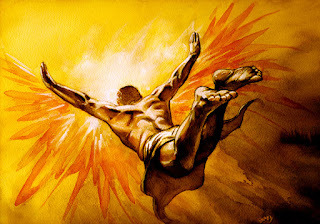 The "Icarus market" keeps going up as money flows out of bonds and in to global and U.S. equities. Valuation mean nothing as everyone is afraid to be left behind. Particularity the 30 stocks of the DOW are at near insane levels with stock like CAT reaching crazy new highs, whiles sales are only up slightly. Consumer demand being flat was also a concern, then look what happened to Under Armour this week. I think next week the march up continues, but I think we are way overbought and as we saw in 2016, a pull-back at the start of November is a real possibility. Here is the weekly SPY. I remain long equities but defensive. I have some bonds and gold as a hedge and I must say as of Friday . . . they don't look so great.